This recipe jumped out at me; the salty chew of proscuitto combined with sweet dates, creamy cheese and chicken sounded enticing. Start to finish, the recipe suggests, should take only 30 minutes; easy elegance without much fuss. I found it in the “Everyday Easy” section of the May issue of Better Homes and Garden Magazine. I was curious how long it will take me – I turned my timer to 30 minutes, put away my laptop and phone, and cooked (for once) without distraction. 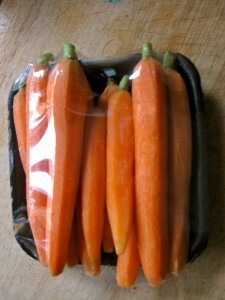 The perfect sized carrots for steaming whole; not too big & not too small. I purchased all the ingredients at Plum Market, selecting jumbo Medjool dates, which the gentleman who assisted me at Plum said were the juiciest brand they carried. They also had pre-peeled baby carrots, which had more flavor than those tiny carrots bagged carrots one usually sees. It’s said since air-chilled chickens don’t depend on ice-water for chilling, they don’t absorb so much excess water, which may contain chlorine. As well, the chicken is juicier and more tender. Carefully flip chicken when one side is golden brown. I purchased Bell and Evans air-chilled chicken. And yes, even frugal-minded me is willing to pay the extra cost for chicken raised in a humane manner without using antibiotics. I tweaked the recipe adding less balsamic (my Fustini balsamic is thick and rich to begin with) and more water. And about that timing. Working at full throttle the dish took me 40 minutes, start to finish. Maybe it was the occasional photo slowing me down, but every extra second was worth the effort. The resulting dish was delicious! Cut chicken in half, through the center horizontally. Lightly season with freshly ground pepper (the cheese and proscuitto, for me, were enough sodium). Top each breast with enough cheese to fit under a slice of proscuitto. 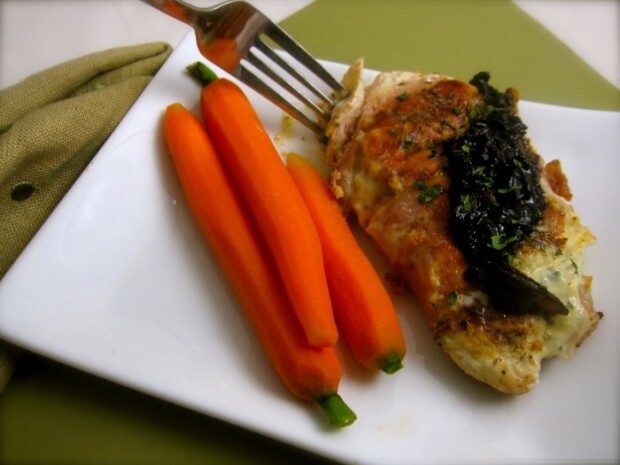 Wrap procuitto around cheese, making sure to cover cheese; tuck ends under chicken. In a large non-stick skillet, heat oil over medium-high heat. Cook chicken, cheese side up first, over medium high heat for 4-5 minutes, or until golden brown. 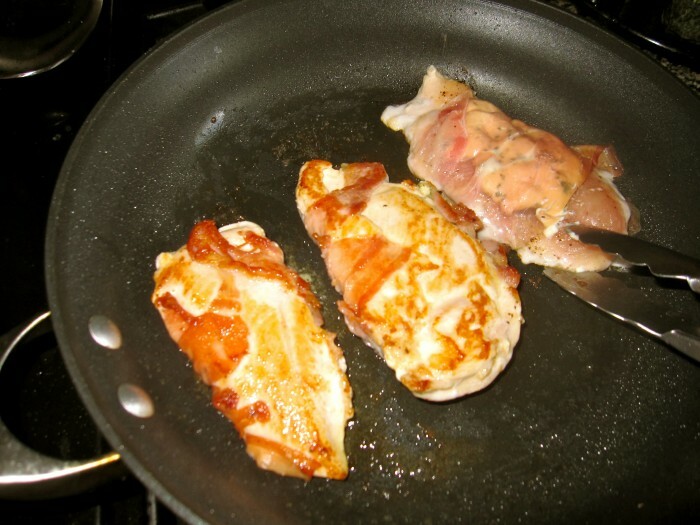 Carefull flip chicken with prongs or a spatula; reduce heat and cook an additional 4 to 5 minutes until no pink remains in chicken. (Note the cheese may leak a bit; my Calphalon non-stick skillet kept that from being problematic. )Transfer to platter and cover to keep warm. Remove skillet from heat and wipe clean if necessary. Add dates, vinegar, and water to skillet. Return to medium-high heat. Cook, uncovered, 2-4 minutes, until sauce is thickened and dates are soft, stirring to scrape up browned bits.